You've got virus protection on all of your business computers, passwords in place on mobile devices and laptops, and even virus protection on your company smartphones. But have you looked at how secure your website is? If you rely on your site for any aspect of your business, a new plugin from 6Scan helps you find and manage vulnerabilities quickly and easily. While WordPress and other content management systems including Drupal and Joomla are built to be secure, they're a prime target for hackers because so many websites run on them. I personally know of two CMS-based websites that have been compromised; one blog had to recover quickly from a major attack on its WordPress installation, and a friend who manages a local arts incubator had to have the organization’s website rebuilt from the ground up when a hacker took over its Joomla installation. You'll find 6Scan Security in the WordPress Install Plugins section. 6Scan finds vulnerabilities on your WordPress website for free, and plugs them automatically for a small monthly charge. The free version of 6Scan tells you what's wrong with your website and sends you an email notification when a problem with the site that could give a hacker access is discovered. The notifications provide you with enough information that you can fix it yourself if you're technically inclined or have a webmaster on call. 6Scan appears in the left-hand Wordpress sidebar. For $10 a month, the Fortress plan includes a Bodyguard feature that auto-fixes any found vulnerabilities. You also get premium email support and SMS notifications of site issues, in addition to the email you'll already have from the free version. More importantly, 6Scan's research team of ex-military hackers notifies you upon discovering new potential threats. The Enterprise level adds 24/7 site monitoring and phone support for a range of anywhere from $20 to hundreds of dollars per month, depending on the requirements of your business. First, navigate to your Plugins menu from your WordPress Dashboard. Click on "Add New", and do a search for "6Scan". You'll be able to install the plugin from there. You can also download the plugin .zip file from this page and install it from your WordPress Plugins dashboard. 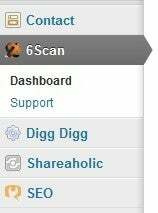 Once it's installed, 6Scan will be available from your left-hand sidebar. You can upgrade at any time from within the 6Scan Dashboard. Once I set up 6Scan on my professional website, it caught a vulnerability and emailed me with all the information I needed to fix it. All I needed to do with the information it gave me was go into the "Readme" file and remove my WordPress version information. If it were something more complex that I felt I couldn't fix on my own, I'd probably upgrade to the $10/month Fortress plan. Information on vulnerabilities is clear and easy to act on. 6Scan isn't the only horse in WordPress's security plugin stable, but it will run with the rest of them. If you've got Bulletproof Security or WP Security Scan installed, you can park 6Scan right alongside them to back them up. 6Scan will be releasing versions for Joomla and Drupal within the next few weeks, and versions for Magento and Amazon EC2 within the next few months, according to owner and CEO Nitzan Miron. Angela West wrote this blog post to the dulcet tones of the "Hackers" soundtrack. She's written for big insurance companies, small wildlife control businesses, gourmet food chains, and more. Follow her on Twitter at @angelawest and Facebook.